The use of metal–ceramic composite layers is of considerable technical interest for many areas of application. The use of electrochemical processes makes it possible to realize coatings on stainless steel which combine the properties of the metals with those of ceramics in an outstanding manner. The process presented here is based on a combination of electrophoretic and electrolytic deposition. At the same time, a very high ceramic ratio is attained in comparison to electrolytic dispersion depositions. It was therefore possible to achieve both nickel–zirconium oxide as well as a copper–zirconium oxide coatings with strong adhesive bonds on stainless steel. A preliminary nickel plating or preliminary copper plating of the stainless steel substrate was first realized. A nanoscale zirconium oxide powder (Tosoh TZ-8Y) from an ethanolic suspension was then applied electrophoretically onto this layer and sintered to an open-porous layer with a porosity of 40–50%. After this, the metal was galvanically infiltrated into the pores. An annealing process was then carried out to improve the layer bonding. Solid-state physical tests reveal that a good material bonding of the composite layer onto the substrate occurred as a result of diffusion processes. Metal–ceramic composite layers can be produced through a combination of electrophoretic and electroplating technology with strongly bond on the substrate by a final heat treatment. 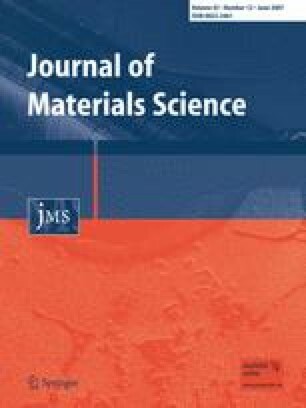 The authors would like to thank Dr. (Engineering) K. Pfeifer and Graduate Chemist P. Mahr, Technical University of Ilmenau for some sample analyses and production of the composite layers. This work was supported financially by the Deutsche Forschungsgemeinschaft (reference KE 359/7-1). We thank Dr. A. R. Boccaccini (Imperial College London, UK) for his comments on the manuscript.